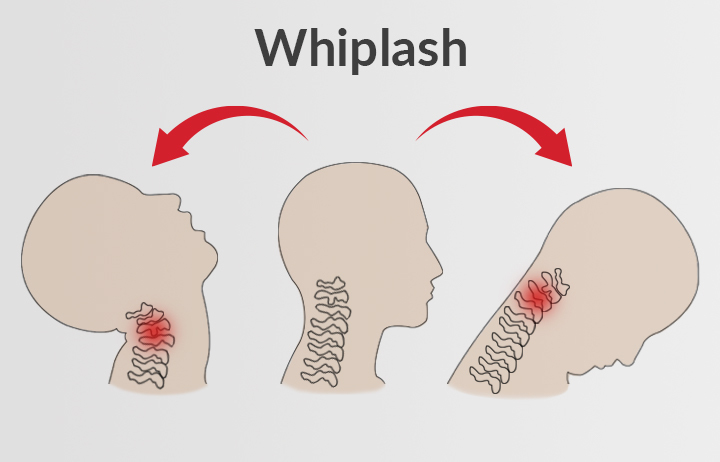 Whiplash occurs when your head moves rapidly in a back-and-forth motion out of your control, injuring your muscles and ligaments (tough fibrous tissues that connect bone to bone) in your neck. Whiplash may be referred to as a “neck sprain” or “neck strain”, but those terms can also include other injuries. Whiplash injuries are collectively referred to as Whiplash Associated Disorder (WAD). Most often whiplash is caused from being rear-ended in a car, but it can also be the result of a sports injury, such as a fall snowboarding or a football tackle, or a heavy blow to the head. The first symptoms of whiplash may not occur for a day or two after the initial accident. Concerned about whiplash? Book an assessment with a physiotherapist today. Whiplash Associated Disorder (WAD) refers to the collection of symptoms caused by whiplash and is graded on a scale, based on the severity of the symptoms. What are the Levels of Whiplash Associated Disorder (WAD)? Whiplash Associated Disorder (WAD) is measured on a scale from grade one to grade four depending on the severity of the injury. Mild whiplash can be treated at home and in a clinical setting. More severe levels of whiplash should be treated in a clinical setting. A pt Health physiotherapist will assess your whiplash. Can Whiplash Go Away on Its Own? Yes, mild cases of whiplash can resolve itself after home treatment. However, due to the complex nature of the injury, sometimes symptoms can resurface even months later, so seeking treatment at the time of the original injury is best for treating whiplash. If you have sustained whiplash from a car accident, it is important to get an assessment from a physiotherapist, chiropractor, or family physician soon after the accident. If you have motor vehicle insurance, they will cover some or all of the costs for Whiplash Associated Disorder injuries.